A letter to Mrs. Sandels asking for the names and addresses of all the Regents and Treasurers for the Daughters of the American Revolution in Pennsylvania. 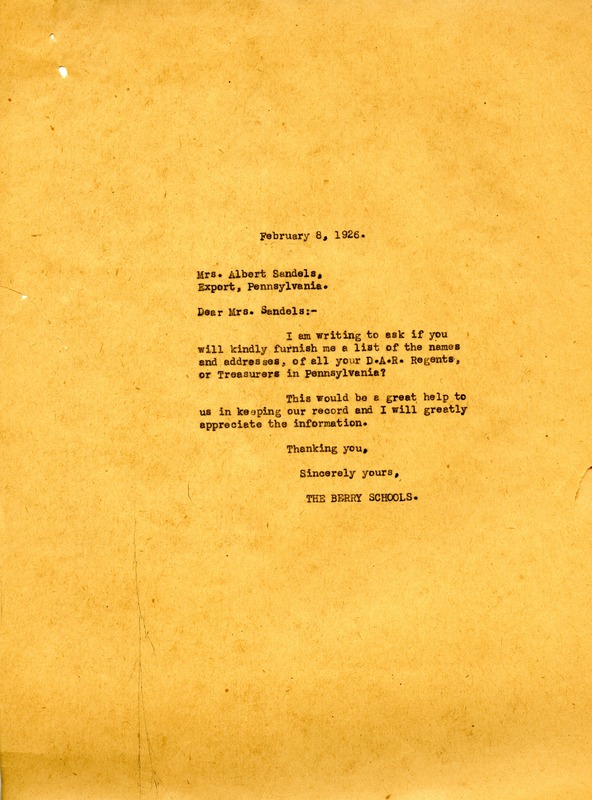 The Berry Schools, “Letter to Mrs. Albert Sandels from The Berry Schools.” Martha Berry Digital Archive. Eds. Schlitz, Stephanie A., Chelsea Risley, Meg Ratliff, et al. Mount Berry: Berry College, 2011. accessed April 22, 2019, https://mbda.berry.edu/items/show/1314.